You are fortunate when your friends know you well. Recently my friend Linda gave me the most wonderful gift. 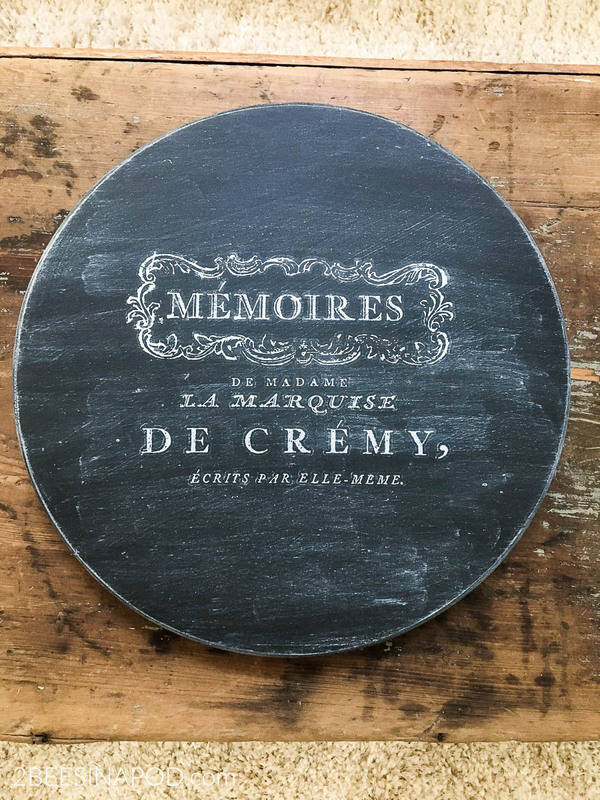 Today I am sharing how I displayed it in my home – a French lazy Susan. Now I ask you, who doesn’t love receiving gifts? Even better is when that gift is perfect and thoughtful as if it were made especially for you! My gift is a gorgeous vintage inspired French lazy Susan. Actually it was a birthday gift from my dear friend Linda. She knows my home decor and design aesthetic almost as well as I do. 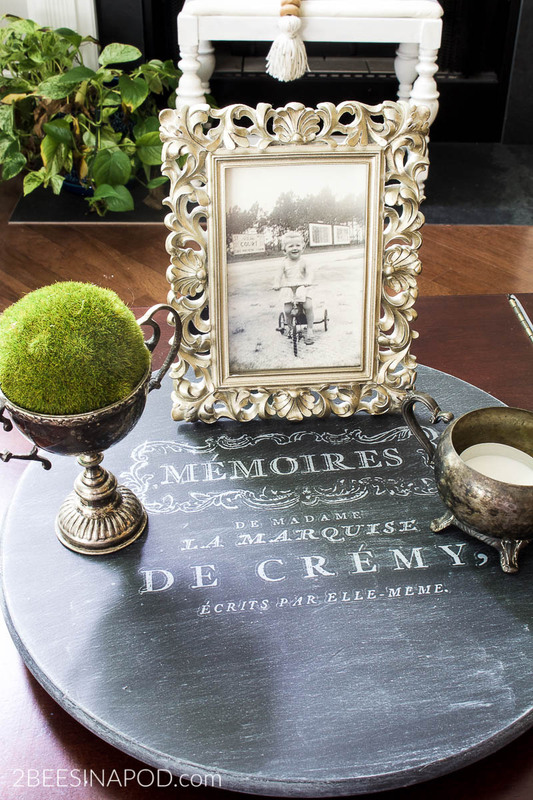 I couldn’t wait to create a French lazy Susan vignette on my coffee table. Typically I change out displays on my coffee table frequently. 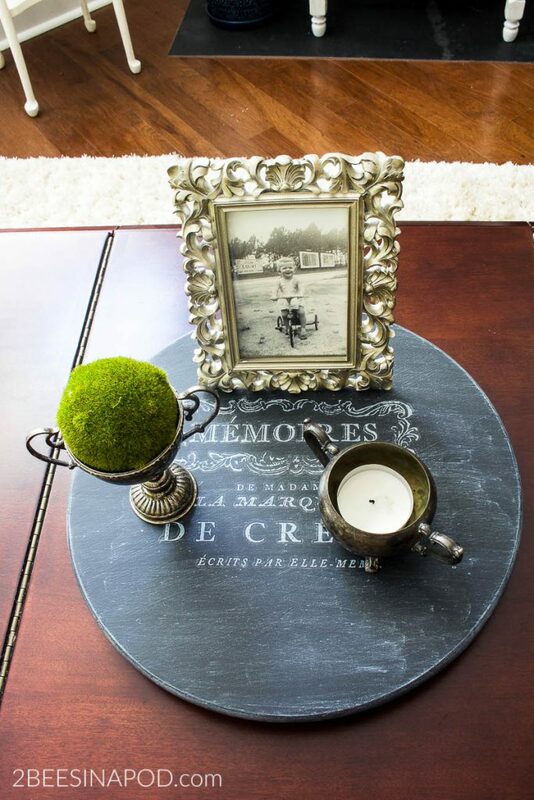 Usually I do this as the seasons change and I even created a post How to Style a Coffee Table. Luckily for me, I currently have two coffee tables 🙂 Since my time has been consumed with the Bathroom Makeover, my house has been in complete upheaval. 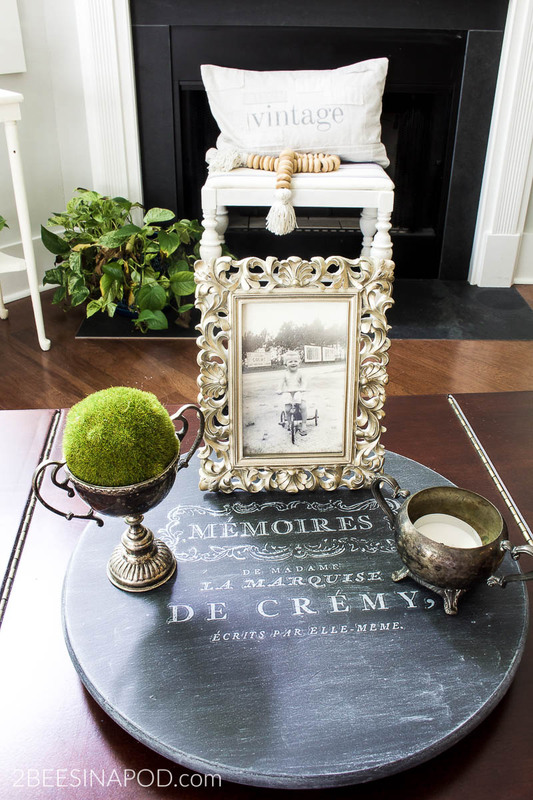 Wanting to have at least one other pretty area in the house, the coffee table was a great focal point. Everything was removed from the coffee table and put away. Being that the house has been neglected, the table also needed a good cleaning (don’t judge). The French graphics on this lazy Susan are beautiful. I’m not quite sure what they all translate to other than “memories”. Since it was close to Mother’s Day when I created this vignette, I was definitely feeling misty-eyed and the tug at my heartstrings was strong. I always miss my mother, but especially at this time of year. There are so many celebrations, so close together – my birthday, Jenn’s birthday, Mother’s Day, my wedding anniversary and then my mother’s birthday. 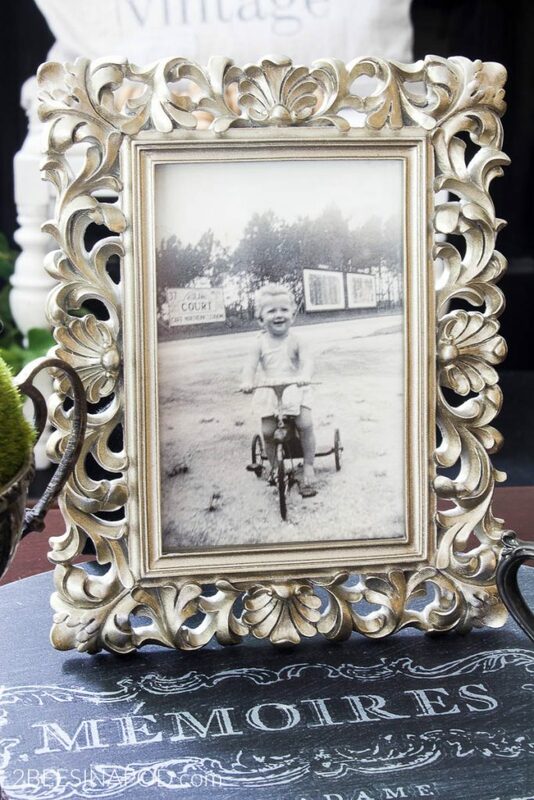 This sweet photo is my mother as a little girl when she was about 3-years-old. Isn’t she the cutest? What I wouldn’t give to have some of those curly ringlets. If you are a frequent reader of 2 Bees in a Pod you know how much I love vintage family photographs. You can see how I created oversized engineer art prints from small family photographs. Also, I created tissue paper canvas art from beloved vintage photos. My firm belief is that when you display photographs in your home they should either be very current (no more than 12 months old) or black and white vintage photos that are over 30 years old. This way your home always looks fresh and up to date. This lazy Susan turns and spins. I look forward to being able to display other vignettes in the future. Wouldn’t this be cute with a collection of white milk glass displayed under a glass cloche? Maybe I could showcase some plants or cobalt pieces. If I use parchment paper I can even serve cheese and appetizers! 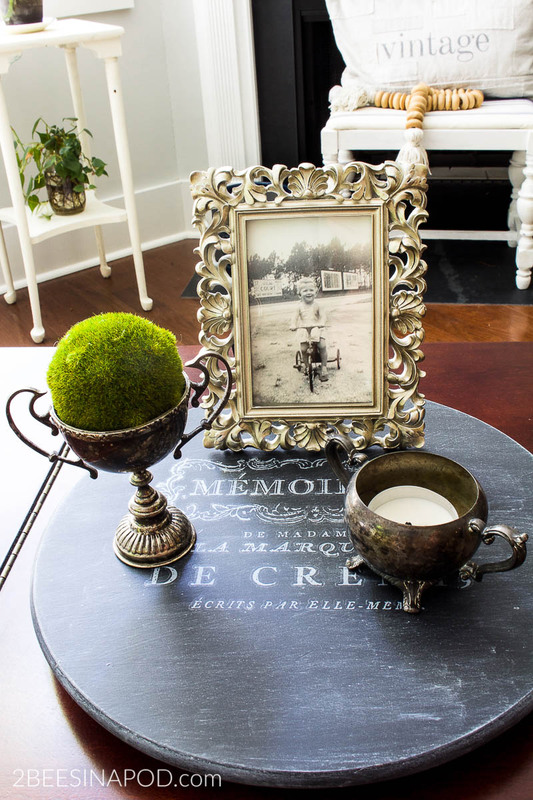 For now I think the vintage silver sugar bowls look beautiful paired with the silver photo frame. In the meantime, I will count my blessings for this valued friendship and this thoughtful gift. I treasure them both! Don’t Forget to Pin to Your Favorite Pinterest Board! Love the vignette. Do you know where your friend found the French stencil.? Hope this helps! We appreciate you following along! Thank you so much. I was hoping it would be made already. Do you know if that Lazy Susan is available for sale anywhere? And you table is beautiful. You can usually find these at thrift stores. Good luck!